Over many decades the global development of professional accounting education programmes has been undertaken by higher education institutions, professional accounting bodies, and employers. These institutions have sometimes co-operated and sometimes been in conflict over the education and/or training of future accounting professionals. These ongoing problems of linkage and closure between academic accounting education and professional training have new currency because of pressures from students and employers to move accounting preparation onto a more efficient, economic and practical basis. 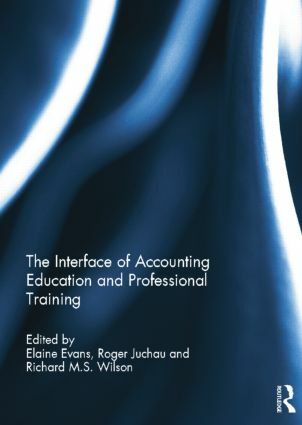 The Interface of Accounting Education and Professional Training explores current elements of the interface between the academic education and professional training of accountants in Australia, New Zealand, South Africa and the UK. It argues for a reassessment of the considerations and requirements for developing professional accounting programs which can make a student: capable of being an accountant (the academy); ready to be an accountant (the workplace); and professional in being an accountant (the professional bodies). Elaine Evans is an Associate Professor in the Faculty of Business and Economics at Macquarie University, Australia. Her current research interests include financial reporting in Australia under IFRS, differential reporting for SMEs, corporate governance, the interface between the academic education and professional education of accountants, the accounting profession internationally, and the integration of graduate attributes into the accounting curriculum. Roger Juchau is Emeritus Professor at the University of Western Sydney, Australia, where he was appointed in October 1990 as Foundation Professor of Accounting and Management. Before coming to the University of Western Sydney, he was Foundation Professor of Accounting and Finance, Lincoln University New Zealand and Commonwealth Foundation Fellow at the University of the South Pacific. Richard M.S. Wilson has devoted his career to boundary-spanning (e.g. as practitioner as well as professor, across disciplines, and in different geographic jurisdictions). He is Emeritus Professor of Business Administration & Financial Management, and Visiting Professor in the Department of Information Science (both at Loughborough University, UK), the founding editor of Accounting Education: An International Journal, and holder of two Lifetime Achievement Awards.